When you traded in your “office” job for a “home-office” one, you imagined all the amazing changes it would make in your life. No more hellish commutes, no more stuffy office attire to wear or fancy lunches to buy. And goodbye to office drama and incessant meetings—and hello to work-life balance! The biggest benefit that you dreamed about when you thought of your remote job, though, was saying farewell to insanely expensive child care costs and babysitters. After all, you’ll be working from HOME, right? No need for a nanny anymore—you’ll be able to swing both! Truth be told, working from home when you have kids at home too is rough. It’s really rough. Even if you have teenagers who are fairly independent, it’s still tough. The good news is that it’s definitely doable—with a little creativity. 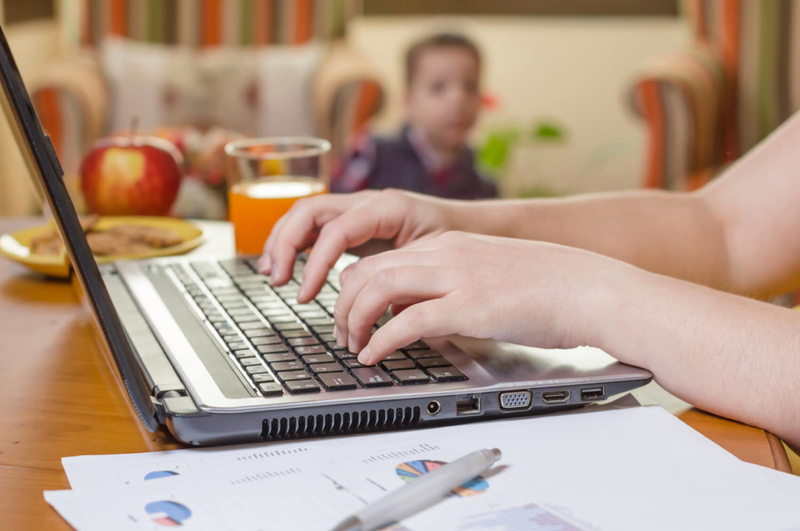 Here’s how to work from home when your kids are at home, too. There’s no getting around it. Your work life will be dictated by your child’s schedule. If your child is young and not in school yet, that means finding time to work between playdates and feedings, the ever-elusive nap, and reading time. In the beginning, (and for quite some time), your schedule will be manic at best. But eventually you’ll learn how to grab those moments when your child is occupied with some Play-Doh and dash off those emails that have been sitting in your Drafts folder for hours. You know the expression, “Sleep when your child sleeps?” Yeah, not so much when you work-from-home. It’s inevitable that something (and usually, many somethings) will happen during the day and rock your already precarious schedule. The only way to make up those hours is to work at night. So even if The Walking Dead is calling your name, take a quick breather once Baby is down, and then start plugging away at work. You can catch up with Daryl Dixon when you’re done with your work. You’ve got a mega presentation due—and your toddler has come down with a cold. You need a few uninterrupted hours in order to finish your project, but your kid wants to be entertained, too. At some point, you’re going to need to hire a babysitter to get you through the rough times when you simply need an extra pair of hands. The frequency of using a babysitter depends primarily on your child’s age and schedule, your typical workload, etc. Even if you are set against having outside help, it’s good to have someone (or a few someones) there in case of a work emergency. Chances are, there are other parents in your neighborhood who are also struggling with kid care. So why not form a parents’ co-op in which you take turns caring for each other’s children? Having a few parents means that you might lose one day (or part of a workday) while you sing The Wheels on the Bus or help little ones on the swing set, but you’ll also be able to score some extra days to work child-free—and cost-free, too. Whether your partner works outside the home or just at the next desk, it’s important to take turns caring for your kiddos. Alternating feedings, diaper changes, and naptimes can help you get a couple of hours of uninterrupted work. Just be sure to explain to an office-worker spouse how difficult it is to get work done when you work from home when your kids are home, too. (Sometimes people have to experience it in order to get it!) Then create a schedule that works for you both. If you have kids of varying ages, it might be possible to include them in your workday. Older kids (of the teen set) can help you by making post office runs, greeting clients, or even babysitting younger siblings. Elementary school aged-children can help you in the office by sorting mail, shredding documents (with supervision) and even perform color-coded filing. It’s not always about keeping kids occupied so they leave you alone to work; sometimes including them is actually the best option. It’s definitely a learning curve when you want to work from home when your kids are home, too. But that shouldn’t scare you off from pursuing your dreams of working remotely. It’s good to be prepared for what it will involve, but know that it is worth it. After all, there is nothing better than seeing your baby’s sweet face immediately after finishing your work for the day. Nothing.